As I’ve mentioned before in numerous posts, I get through a fair amount of sports nutrition products, mainly because I train hard and they’re convenient to take on rides. It’s also because they last a long time, so I can have a box of bars in the cupboard that will see me through a couple of months, whereas homemade energy snacks tend to go off before I’ve had the chance to eat them. If you’re interested to see what I use regularly, click here to see some of the products that have made the grade so far – by no means a comprehensive list as I still haven’t tried everything. Along with energy bars and gels, of course I eat a lot of normal food when I’m not on the bike, frequently things such as quick and healthy such as sardines on toast when I’ve just got back from riding (or any of these foods listed here). But other times, when I’ve done a really long, tough workout or a race, I feel like I’m no recovering properly or I’m away from home (say, at the Velodrome) I like to use protein powders or bars after my ride. Herbalife 24 sent me some of their Rebuild Strength powder to try and erm… I’ve used it all up so I’m unable to take a photo of it to show you, so that’s I clear sign that I liked the stuff. Recovery socks, recovery drink… Worth a try, eh? My legs feel bloody terrible today! I don’t normally go for chocolate flavoured powders as I’m not actually at all fussed about chocolate, but the Rebuild Strength comes in just the one flavour. Which is weird – I think they should offer a choice because if I were using it regularly, I’d quickly get bored of having the same thing all the time. Despite the lack of choice, the flavour is pretty good, it doesn’t taste synthetic or chalky and it mixes up easily using a shaker bottle. With 25 grams of protein per serving (in the form of whey and casein) but also a fair amount of carbs, the drink is in my opinion, best used after intense exercise. You’ve also got branch chain amino acids and L-Glutamine which can speed up the recovery process and according to studies, can help the immune system cope with the stresses of ‘intense exhaustive exercise.’ As someone who can feel a bit wiped out from training, sometimes struggling to recover properly, that appeals to me. Or you can do what I like to do and make recovery smoothies with it. I sometimes blend it with frozen sliced bananas, or berries or coconut water, depending on what I have to hand. 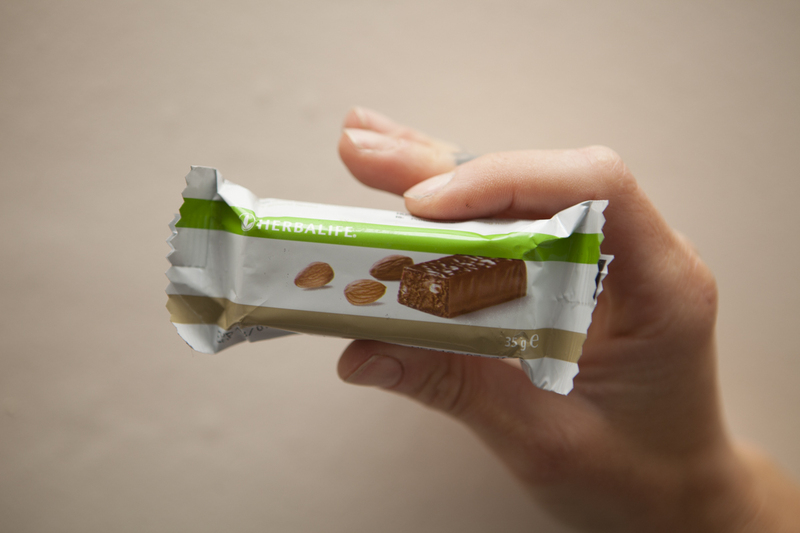 The other product I’ve been using is Herbalife’s protein bars. These are like dinky chocolate bars, though they’ve a much higher protein content (1o grams) and fewer calories (140 kcal).They also contain vitamins B1, B2, B6, vitamin E and pantothenic acid. I’ve tried the chocolate almond and chocolate peanut flavours and both taste really nice but personally, I find it weird to work out and then eat a chocolate bar of any kind so I prefer to just have a stash of these in the car and only eat them as a slightly better alternative to something at the service station! The bars have less fat than regular chocolate bars, however I can’t ignore the high levels of fructose and glucose syrup, aka sugar, each diminutive bar contains. 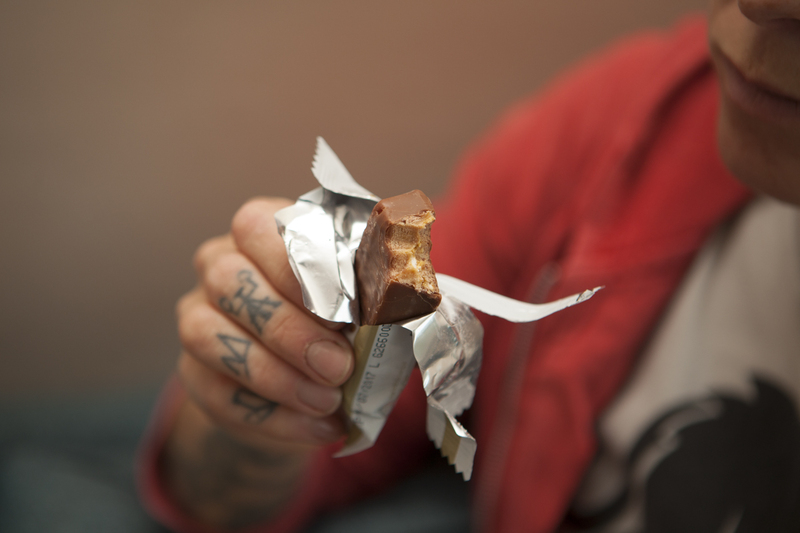 Dave doesn’t care about that kind of thing and loves them; I guess these bars are for those with a sweet tooth!